Playing awesome rock rhythm guitar riffs is a lot of fun and makes you feel like a badass every time you pick up your guitar. Best of all, you can play amazing rhythm guitar riffs even if you can’t play guitar fast and don't know a lot of chords yet. Playing guitar tight. It’s not about what you play - it’s about how you play it. This means you play every note and power chord very tight (learn how to do it below). Playing tight makes your guitar riffs sound awesome at any speed. Learning exactly what to listen for when you practice rhythm guitar, so you can correct your mistakes and improve very quickly (more on this below). Having patience and perseverance. Playing rhythm (and playing in time) doesn't come naturally to many people because most guitar players don't invest a lot of time into practicing to improve their rhythm playing. You will master rhythm playing a lot faster when you have perseverance and believe in yourself even if you struggle in the beginning. Watch this video to learn exactly what to listen for to make your rhythm guitar riffs sound awesome. 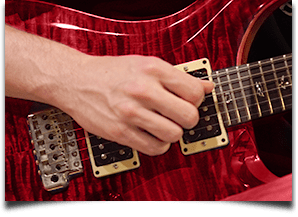 Rhythm guitar mastery is also about knowing how to be creative with your guitar riffs, so you sound great even when you are playing simple power chords (this is a lot easier than you think… keep reading to learn how to do it). Playing tight rhythm guitar means: playing guitar in perfect time and with consistent palm muting. Learn how to make your rhythm guitar playing sound more tight. Learn how to record super tight rhythm guitar tracks in the studio. Record yourself playing 25 quarter notes, strumming a single power chord. Do this with a metronome or a simple quarter note drum beat. If you are playing in perfect time, it will seem like the click has disappeared (become silent) while you play because your guitar playing is perfectly “on top” of it. However, if your playing is slightly behind or rushing ahead of the click, this will be a sign that your timing needs work. Want a quick and easy way to tell how good your timing is? Take this fun rhythm guitar quiz and try to find flaws in each recording you hear. You can do this without your guitar and learn exactly what to focus on to improve your rhythm playing quickly. The other part of playing tight rhythm guitar is consistent palm muting and articulation. This not only makes your playing sound way better, but also saves you a lot of money and time if you ever record your guitar playing in a real studio. To make your palm muting very tight, find the sweet spot on your guitar where the muting intensity is just right (not too aggressive and not too soft). Keep the pressure and hand position the same as you play your guitar riffs. Step 2: Play through your 4 measures of rhythm using a single power chord (play to a metronome). 4 1 3 2 3 1 2 4 2 1 4 3, etc. (make the order of the measures completely random). This process helps you create dozens of rhythmic ideas that you can use to write killer guitar riffs very quickly and easily. After you create a rhythm you really like (see tip #2), add other notes or chords to it to complete your riff. Use any notes or chords you want until you are fully happy with the riff. Step 1: Make a list of 10 guitar riffs you already know well. These can be guitar riffs you wrote yourself or riffs from your favorite songs by other bands. Step 2: Take the first guitar riff from step 1 and change its rhythm 10-20 different ways. The changes don’t have to be significant and you can vary any part of the riff freely. Important: do NOT change any of the notes (or chords) in the riff. Only vary the rhythm. (However, you may insert rests in place of some of the notes). Pinch harmonics make your guitar riffs sound amazing and make you feel like a guitar playing badass. 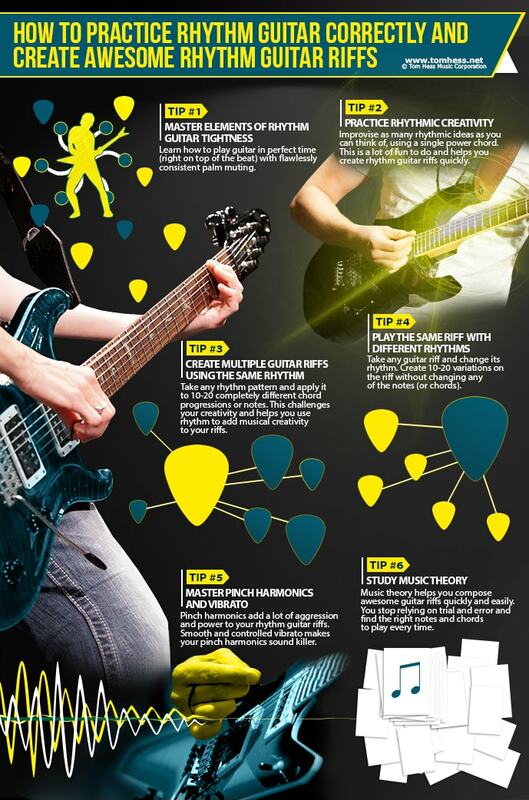 Studying music theory helps you create awesome guitar riffs quickly and easily. You can stop relying on trial and error and know exactly what chords (and notes) to play to make your riffs sound the way you want. Now that you know how to write killer rhythm guitar riffs, your next step to becoming a badass guitarist is to test your ability to play rhythm guitar cleanly and in time. Take this rhythm guitar playing test to learn exactly what to focus on to master rhythm guitar easily and fast. Want to quickly improve all areas of your guitar playing? Take online guitar lessons with a great guitar teacher and become an amazing guitarist fast.